I know that each of you is a wonderful woman and a unique beauty. 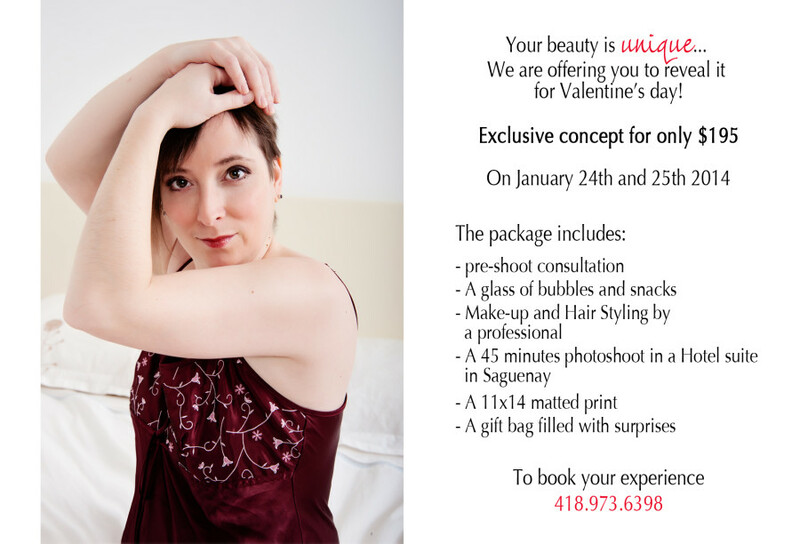 With Valentine’s day approaching, why won’t you love yourself as you are and give yourself a beautiful gift? For the occasion, I decided to spoil you in style on January 24 and 25 with an exclusive photo session in a hotel suite in Saguenay where you will be welcomed with a glass of bubbles. As always, makeup and hair styling will be done by the beautiful, talented and kind Hélène. Finally , you will receive a 11×14 matted print just in time for the most romantic Friday of 2014. Oh yes, the gift bag filled with surprises … It contains a pair of tickets to the Symphony Orchestra of Saguenay-Lac-Saint-Jean‘s concert “Escapade Italienne”, a discount on treatments at l’Auberge des Battures, a lovely body cream, and more. All this for only 195$!!! To book your experience, contact the studio at 418-973-6398 or by email. Hurry up! I only have 10 available appointments. Enjoy all the love that surrounds you.